Well, so says Lee Dixon anyway. 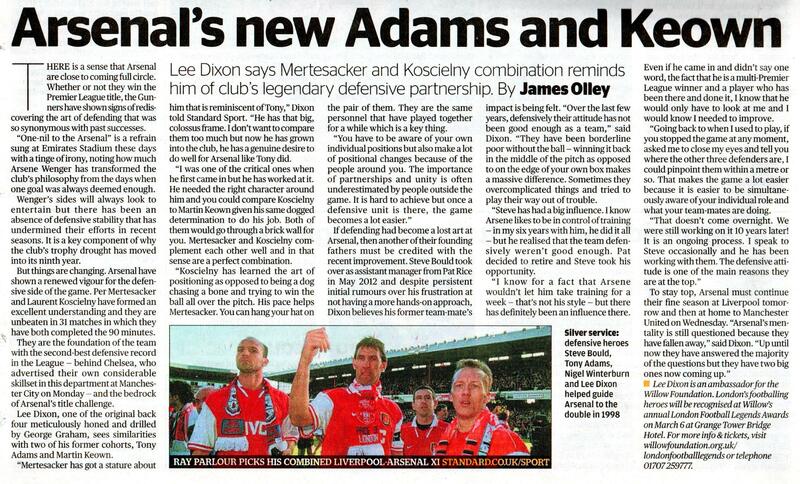 To be precise, he says “Mertesacker has got a stature about him that is reminiscent of Tony,” while “You could compare Koscielny to Keown given his same dogged determination to do his job.” Of course this was said just before the Arsenal defence let in five against Liverpool, which I don’t remember Adams and Keown ever doing, though I guess I’d have to go through the stats on Andy Kelly’s site to be sure. Anyway, aside from that, Dicko is most complimentary about how the current central defensive partnership has shaped up and become (until very recently, ahem) the most solid in the League. He gives a lot of credit to Steve Bould. “Over the last few years, defensively their attitude has not been good enough as a team. They have been borderline poor without the ball – winning it back in the middle of the pitch as opposed to on the edge of your own box makes a massive difference. Sometimes they overcomplicated things and tried to play their way out of trouble.” They still do! This kind of makes me wonder what Pat Rice was doing all those years. I mean, he was a defender too, and a pretty good one. And is the change really down to Arsene realising things needed to improve and effectively asking for help? If it was, then great, because it shows Arsene is willing to adapt to circumstances, which is something his critics including me have accused him of not being able to do in the past. I think we can all agree with Dixon’s basic point: Mert & Kos complement each other and are proving a solid partnership (Anfield blip aside). Certainly Kos has got his positioning much better this season, as I felt that contributed to errors in the past. Maybe Steve Bould has taught him a thing or two about that. Anyway, time to forget Anfield and move on to Wednesday night and the visit of struggling Man Utd – a side that seemingly everyone else in the Premier League has already beaten this season. Surely it is our turn. One more interesting quote from Lee: “Going back to when I used to play, if you stopped the game at any moment, asked me to close my eyes and tell you where the other three defenders are, I could pinpoint them within a metre or so. That makes the game a lot easier because it is easier to be simultaneously aware of your individual role and what your team-mates are doing.” That seems to demonstrate the advantages of good coaching, a settled team and of course top quality players across the back line. It will be a shame if Sagna leaves in summer, as I think we were getting there on all three. How Has Arsene Ended Up With All This Power?